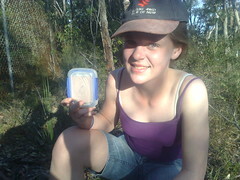 A while back, I went geocaching with my daughter Kate. We spent quite a while hunting for an elusive cache not far from where we live but we thoroughly enjoyed the experience of being outdoors in the sunshine, using GPS technology to have a bit of real world fun. In fact we enjoyed it so much that after we signed the cache’s logbook and returned to the car to drive home, Kate asked if we could place our own cache some time for other people to find. We went home, printed out the official geocaching note to include in the cache, and packed it all into the box. Now it was just a matter of finding a good place to stash it. I had an inclination to stash the cache in a nearby park, somewhere I could keep an eye on it, but a few walks through the park didn’t turn up any really good hiding places. Consequently, the cache sat on my shelf at home for several months while I got distracted by other things. However, today was such a nice day that we decided to finally go hide the cache. After a last minute spray with some green paint (didn’t want to make it too easy to find!) we went to a lovely little park near our old house, in fact the same park where I used to play as a kid. Sure enough, with a bit of hunting we found a perfect spot to hide it… not so obvious that it would be found by passers by, but not so impossible that a keen geocacher couldn’t find it. We called our cache “Childhood Memories”… if you’re ever in the area, see if you can find it! There is a real sense of fun and adventure when you go geocaching. Making our own caused us to think hard about the placement of the box, where would be a good spot, how to find the right balance between making it too hard and too easy, not to mention the physical act of actually getting to the place where we hid it. It was good fun… here is a short video I shot on my phone just after we placed it. I’m really pleased that Katie has taken on the role of being my geocaching buddy. On the way home we had to drive past another cache, so we decided to stop and have a quick look for it. Although I had my regular GPS with me (a Garmin GPS V) I thought I’d try finding this cache using only my new Nokia 95 phone’s built-in GPS. I was a little doubtful that the GPS in a phone would be good enough for this sort of thing, but I was running Geocache Navigator and wanted to try it out. As it turns out, it was spot on, and I mean exactly spot on. A very impressive mobile app, and super easy to use. If you haven’t tried geocaching yet, give it a go. I can see it being a great activity for kids, as evidenced by Kate’s enthusiasm for it. It manages to combine a bit of technology use, some outdoor adventure, resourcefulness and higher order thinking skills, physical fitness and just generally having some fun. Having my own daughter as a geocaching buddy makes it even more special. Placing our first Geocache by Chris Betcher is licensed under a Creative Commons Attribution-ShareAlike 4.0 International License. Congrats on placing your first cache. I hope you get many years of enjoyment from it. We placed our first one in our front yard. My kids get a kick out of watching people hunt for it. These are my two favorite geocaching podcasts. My kids and I started geocaching this summer too. It’s really a fun, family thing to do. We put a couple of caches out in our town as well, and it’s fun to go read the comments that people write. I know my sons would have a lot of fun with geocaching. I just having found the time to do it yet. I think a little handheld GPS unit might make a great Christmas present for the family and give us a new spring, summer, and fall hobby. You’ll have to let us know what type of comments you get in you cache. I like the idea of putting it in your front yard. It would be quite fun to watch people trying to find it. On the other side though, wouldn’t you worry about all those people messing up your yard? I read about Geocaches in a journal but your blog posting brought it more to life. I wrote a blog post on it (http://jamorgan.edublogs.org/2008/10/10/geocaching/). I haven’t tried geocaching yet – although I can see if might be a good holiday activity with my children! Previous PostPrevious I just want to (edu)Blog!